Andøya / Vienna, 23 May 2017 – Schiebel’s sophisticated Unmanned Air System (UAS) was presented to the Norwegian Coastguard, Royal Norwegian Navy, Royal Norwegian Airforce, Norwegian Coastal Administration, Police Directorate as well as other Norwegian authorities during demanding trials at Andøya Test Center (ATC). During the event held in Northern Norway, approximately 300 kilometers north of the Arctic Circle, the CAMCOPTER® S-100 performed a series of challenging demonstration flights in the second week of May. Taking off from Andøya Air Base the S-100 presented itself as a highly valuable asset for coastal patrol tasks. Not only did the CAMCOPTER® S-100 again prove its capacity for providing essential data – such as the high-quality real-time EO/IR footage generated by L3 Wescam’s MX-10 – but also successfully tracked vessels and found persons gone overboard. In a separate exercise the CAMCOPTER® S-100 UAS convinced the participants with its impressive range clearance capability. Here, an area of around 2 500 km. was scanned for vessels. 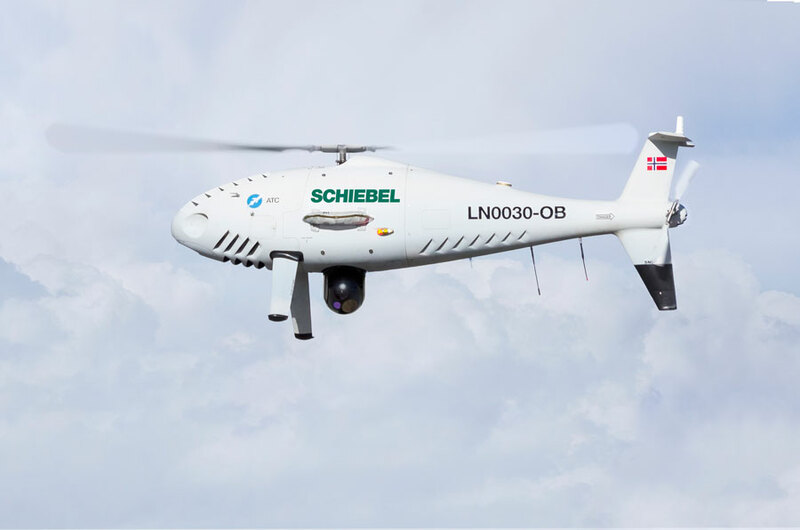 Schiebel’s CAMCOPTER® S-100 Unmanned Air System (UAS) is an operationally proven capability for military and civilian applications. The Vertical Takeoff and Landing (VTOL) UAS requires no prepared area or supporting equipment to enable launch and recovery. It operates in day and night, under adverse weather conditions, with a beyond line-of-sight capability out to 200 km, over land and sea. Its carbon fiber and titanium fuselage provides capacity for a wide range of payload/endurance combinations up to a service ceiling of 18,000 ft. In a typical configuration, the CAMCOPTER® S-100 carries a 75 lbs/34 kg payload up to 10 hours and is powered with AVGas or JP-5 heavy fuel. High-definition payload imagery is transmitted to the control station in real time. In addition to its standard GPS waypoint or manual navigation, the S-100 can successfully operate in environments where GPS is not available, with missions planned and controlled via a simple point-and-click graphical user interface. The high-tech unmanned helicopter is backed by Schiebel’s excellent customer support and training services.